The Patron Saint of Gamers? “Who is the patron saint of gamers?” was a search query that brought people to my blogs over the years. For those finding this page cold, it’s important to clarify just what “saint” means to the Catholic and Orthodox churches. Let’s break it down into two words: “saint” (small ‘s’) and “Saint” (big ‘S’). A “saint” is anyone in heaven. Period. That’s it. If your grandma died in a state of grace and is now in heaven, she is a small-s saint. A “Saint” is a person who is “officially” (more on that word later) recognized as being in heaven. We can’t know for sure if your granny is in heaven, but the Church throughout history has recognized that some people are, without question, not only in heaven, but also models of Christian life. These people are considered “Saints,” such as St. Francis or St. Clare. However, this was not always an “official” process. In the early days of the Church, you became a saint by dying for the faith. Thus, the Church has long lists of people who were killed during the persecutions. Because they died as martyrs, they were automatically considered Saints. Some of their stories we know fairly well (such as Sts Perpetua and Felicty), but some are simply names on a list, with perhaps some pious legend attached to them at a later date (such as St. Christopher). After the persecutions, Saints were chosen from the ranks of holy men and women, usually by popular acclamation with the approval of a Bishop. The Church officially recognized some Saints, while others became Saints through the growth of local, popular devotion to a particular person after his or her death. Since non-Catholics almost always get this wrong, it’s important to point out that devotion to saints is not “worship” of a person, but veneration of the way God has worked in and through that person. They are held up as models to follow, and as examples of God’s work on earth. Prayers to Saints are intercessory prayers, similar to the way we would ask a friend or Church community to pray for us. (Some people misconstrue the meaning of “praying to” as a kind of worship, so think of it this way: we are praying with the Saints and the Saints are praying for us.) The saints are the great “cloud of witnesses” described as surrounding us in Hebrews 12:1. The most obvious example of a saint for our times was Mother Theresa, who is in the process of being canonized. Patronage is almost always the result of popular devotion, and the origins of a particular patronage may be completely lost to history. Although the Church has named certain people as patron saints of certain causes or places, most of the popular patron saints simply evolved over time without an official process or declaration. Patronage simply forms a point of contact for a specific aspect of the human experience, such as fatherhood (St. Joseph), motherhood (St. Monica), farmers (St. Isidore), soldiers (St. Martin of Tours), cancer (St. Peregrine) and so on. Because a particular Saint is already in heaven, and has some relation to a particular subject, they are believed to be more effective advocates for intercessory prayer. There is no patron saint of gaming. The closest we can get are St. Balthasar and St. Cajetan. St. Balthasar is frequently listed as the “Patron Saint of Playing Card Manufacturers.” I’ve taught the Saints to 8th graders for years, and I have to tell you: that’s one of the most mysterious things I’ve ever found. I have dug deeply in order to figure out how and why Balthasar got attached not to card playing or cards, but to playing card manufacturers. Balthasar, along with with Melchior and Caspar, is one of the magi who brought gifts of gold, frankincense, and myrrh to Jesus. However, the Bible 1) does not name the magi, 2) does not say how many there were (they are usually depicted as 3 men because there were 3 gifts, but some ancient sources believed there were 12), and 3) does not say what they were (astrologers, magicians, kings, or simply “wise men”). Names of the wise men don’t appear before the 5th century. We know nothing else about St. Balthasar. There are several purported tombs of the magi, but no one takes their claims seriously. If there is some source or document that explains why St. Balthasar was given the care of people who make playing cards, it has thus far eluded me. Early cards were simply made by printers or artists. In the absence of hard evidence explaining the Balthasar/card connection, the most obvious reason may be the actual answer. Balthasar was a “king.” Playing cards have “kings.” Ergo, it was natural to pick one of the Three Kings, and Balthasar got the job. St. Cajetan (known as St. Cayetano in Spanish-speaking countries) is the Patron Saint of Gamblers. Cajetan, born in 1480, was a lawyer and the son of a wealthy family. Driven by a desire to reform the Church, he traveled to Rome, became a priest, and founded a religious order. He used his family fortune to create hospitals that served both the physical and moral needs of the poor. He also established pawn shops and credit unions to provide loans to the poor. Cajetan’s connection to gambling is obscure. Popular lore says the people would ask him for a favor, and bet him a rosary that he couldn’t come through. Since he always came through, he was able to get people to pray more. Based on what I know of saints, this feels like a pious retrofitting of a reason to a patronage, and it just doesn’t sound likely. It’s more probable that his loans helped people get out from under the predatory interest rates of loan sharks, and many of the these loans were the result of gambling debts. Then, as now, a compulsive gambler could destroy his family, so it seems more likely that Cajetan probably helped problem gamblers get back on the right path both financially and morally. Over the years, readers have found their way to this post and suggested other candidates. I’ve always recommended St. Aloysius Gonzaga (1568 – 1591), based on a story I once read. He was playing chess with some seminarians, and someone posed the question, “what would you do if you knew you had but an hour to live?” One said hewould go to confession, another that he would pray before the Blessed Sacrament, but not Saint Aloysius. He reasoned that, since his superiors gave him permission to play the game, and he had no other pressing duties, clearly, this is what God wanted him to do. So, in his final hour, he would finish the game! Yes, they chose the successor to the betrayer of Jesus by rolling dice. Okay, so they probably weren’t dice. In the Judaism of the apostles’ time, a chief priest could cast lots by drawing one of two sacred stones from his breastplate. One stone was a “Yes” stone, and the other meant “No.” You can find some examples of lot-casting in 1 Chronicles 24 and 26, and, of course, in Jonah and Esther. “Purim” is the Hebrew word for “lots,” as well as the name of the Jewish holy day commemorating the events of Esther. The problem is that Matthias vanishes without a trace after this. (Perhaps that 12th apostle slot was cursed.) He may have been crucified in Ethiopia, stoned in Jerusalem, or died of old age. This last one is unlikely: few early Christian leaders died peacefully in their beds. Of the original 12 apostles, only St. John died a natural death. Currently, Matthias is the patron for alcoholics, carpenters, tailors and … the town of Gary, Indiana. In the end, we’re still left with few facts and no current patron saint of gamers. However, I think St. Cajetan fills the bill pretty well. He has some connection with gambling, which can be an element of gaming. But he also has connections with banking, which is simulated in many games. He used his wealth to help others, and had a deep sense of compassion. He fought the clerical corruption of his time by being a living example of Christian charity and care for the poor, and seems to have have been an all-around good guy. 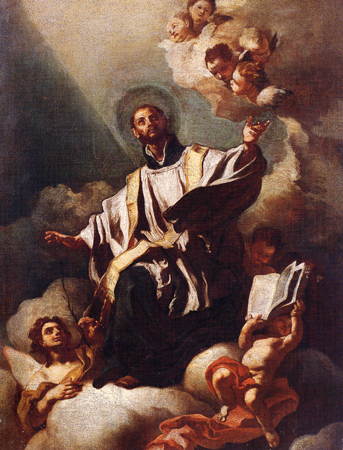 So, in the absence of another viable candidate, I’d like to nominate St. Cajetan as Patron Saint of Gamers.